Detail from cover of Injun; image by Anishinaabe artist Rebecca Belmore. Jordan Abel. Injun. Vancouver: Talonbooks, 2016. In this review we discuss Injun, a book by Nisga’a poet Jordan Abel that confounds almost every truism about contemporary poetic production. Injun was the 2017 recipient of the Griffin Poetry Prize—Canada’s most generous award for a single volume of poetry, and one that indicates a certain level of acclaim and influence. However, Abel’s work is not of the sort that is generally recognized with prizes: resolutely, unrelentingly experimental and conceptually rigorous, it sits outside the lyric mode most often rewarded with such accolades. Unlike much poetry, whether lyric or experimental, Injun is deeply indebted to genre fiction, being a composite of 91 pulp western novels. As such, it shares in the contemporary trend of erasure poetry, yet it does not simply extract crystalline lyrics from within larger “non-poetic” texts. Rather, Injun sits alongside the works of M. NourbeSe Philip, Divya Victor, Douglas Kearney, and others who use conceptualist and visual techniques to dramatize the ways in which language encodes and naturalizes racist power structures. Complementing the popular discourse of cultural appropriation, Abel’s textual appropriations address a continent-sized theft. Injun is Abel’s third book, following The Place of Scraps (Talonbooks, 2013) and Un/Inhabited (Project Space Press and Talonbooks 2014), the latter a highly visual volume published on the occasion of the Vancouver Art Book Fair. Across these three titles, Abel investigates the linguistic basis of settler colonialism using a set of tools related to appropriation and conceptual writing: cut-up, pastiche, erasure, and visual poetics. These texts build a body of work that coheres, but that also develops and deepens from one iteration to the next. While The Place of Scraps is primarily an erasure of the work of anthropologist Marius Barbeau’s studies of the Nisga’a and other Indigenous peoples, Un/Inhabited and Injun take Project Gutenberg’s public domain repository of pulp westerns as a corpus to examine and undermine. As critics and reviewers of Abel’s work often note, the text of these two books comes from a master document containing the full text of 91 westerns published between the mid-19th and mid-20th centuries, copied and pasted into a single Word file. In order to write both books, Abel searched this document for keywords related to North American westward expansion (words like “territory” and “uninhabited,” for example). He then excerpted the relevant sentences, creating poems collaged from these lines. In many cases, Abel subsequently removed the titular term, leaving blank spaces that make the terms’ ubiquity palpable through their absence. It is telling that there were enough instances of the word “injun” in the master document that Abel could write an entire book using only the textual material surrounding this specific slur. 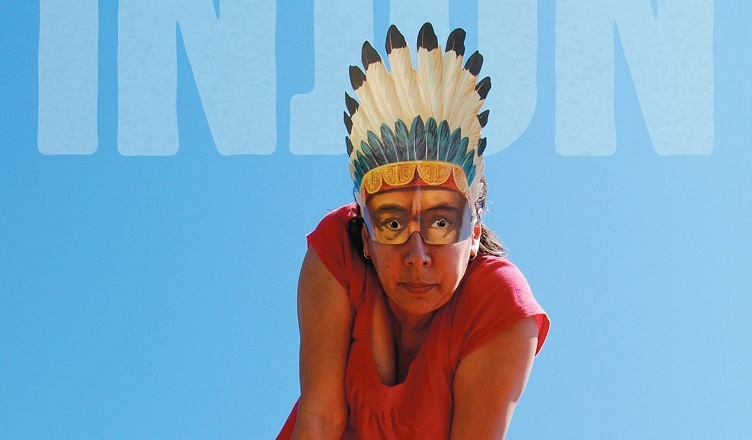 The cover of the book makes clear that the word “injun” is itself a kind of pastiche: a photograph by Anishinaabe artist Rebecca Belmore, it shows a person (likely Belmore herself) standing atop a red car with her body folded forward, hands on knees, gazing directly at the viewer. Set against a background of blue sky, the person wears a mass-produced die-cut half-mask, a replica of a Victorian-era toy depicting the top half of the face of an “Indian” in an approximation of a Plains-style headdress. The mask obscures the wearer’s face from the bridge of their nose upward; the eye holes in the mask arrest the viewer in their gaze, but they conceal the wearer’s own eyes. The mask serves as a visual reference to the long history of stereotypical representations of Indigenous peoples created by settlers, while the body of its wearer—posed confrontationally yet casually, bending as if to speak to a child—points to a separate Indigenous reality, distinct from the settler epistemologies that group hundreds of distinct peoples under the flattening misnomer. The book’s structure performs a similar confrontation with what has been naturalized or made familiar. The titles of its five sections, “Injun,” “Notes,” “Appendix,” “Sources,” and “Process,” at first seem to follow the expected progression of a book with ancillary or paratextual material that helps clarify the main text. Yet when the reader turns to sections titled “Notes” or “Appendix,” they are not presented with explanatory documentation, but with more poetry. Nonetheless, the sections of the book do perform the functions of paratexts, in that they provide contextual information, clarification, and point outward from the book itself toward the other texts from which it is composed. Importantly, they teach us how to read. In the next section, “Notes,” we track the footnoted words from these alphabetized poems across a series of numbered visual poems that showcase additional material from Abel’s linguistic corpus. A column of text is carefully aligned so that the footnoted term appears as a vertical stack running down the page—a poetic technique known as a “concordance line.” This central term appears in bold, while the remainder of the sentence is grayed out and appears to extend beyond what is presented on the page: the heads and tails cut off mid-word—and sometimes mid-letter—as if to imply that we are only accessing a narrow window into a vast concordance. 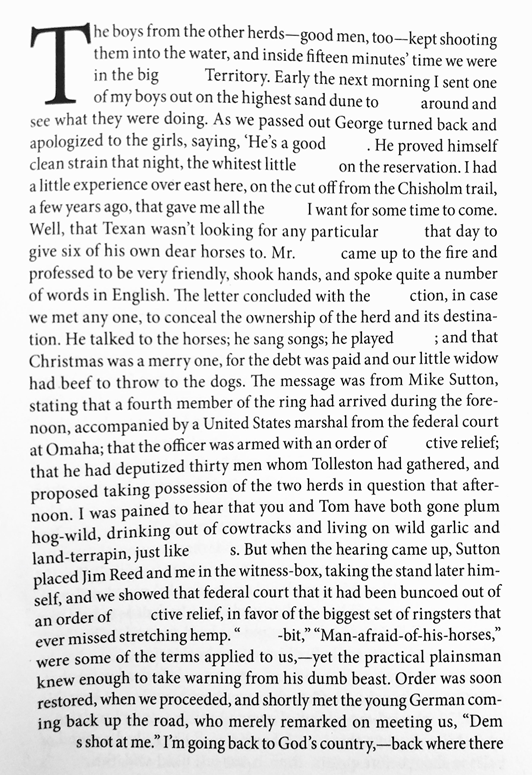 The terms in “Notes” are varied: while some, such as “whitest” and “frontier,” clearly reference the racial politics of a settler colonial history and present, others, such as “truth,” “tenderness,” and “faith,” provide unexpected routes through Abel’s textual archive that nevertheless reveal the Western genre’s assumptions and power dynamics. 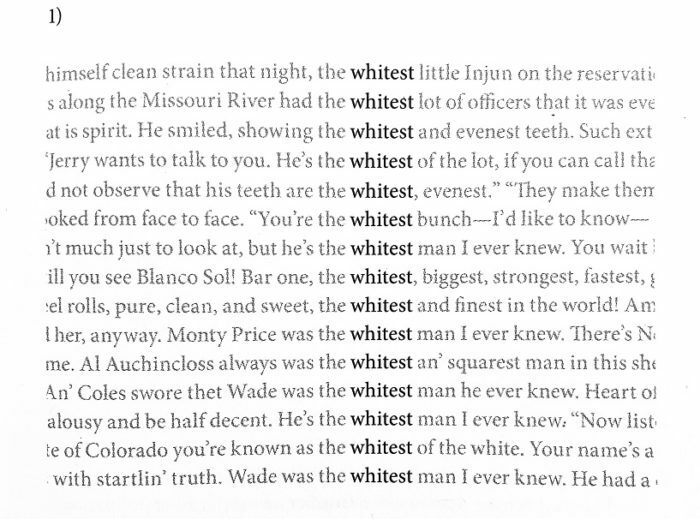 The concordance line reveals the multiplicity of usage—the word “whitest,” for example, refers to the color of teeth as well as to the valuation of racial whiteness. Yet, in stacking dissimilar meanings and presenting them in uncomfortable proximity to one another, Abel foregrounds the affective density the words’ most charged meanings carry, highlighting the ways in which these uses blend into and shape the words’ other meanings and cultural associations. Although these quotations are stripped of context, their identity is nonetheless available to the reader in the section titled “Sources,” itself a list of the titles from which Abel has constructed the book. Grouped by author, we see the extent to which a single individual—for instance Zane Grey, author of 24 volumes—had the power to propagate the western myths that so entranced generations of North American readers. Lest we imagine that the phenomena Abel documents are ancient history, however, the most contemporary of the authors listed in “Sources” is André Norton, who died in 2005. The “Appendix,” as in a scholarly text, provides additional framing material, but here in the form of an 18-page poem pastiched from lines in the concordance containing the epithet “injun.” Adopting the form of the opening page in a chapter from a western, the text is laid out with a large initial capital and a wider textual column than the preceding sections, suggesting it will align into a familiar prose narrative. Abel subverts these expectations, however, because not only do the sentences not follow logically one from the next, but also in each instance the term “injun” has been erased, leaving a gap that refuses to repeat the slur while also marking its ubiquity. These imposed textual gaps, functioning as a form of caesura, serve to demonstrate the attempted erasure of Indigenous peoples from the North American west—as well as the discursive erasure of Indigenous peoples that is exemplified in western novels. These novels trade on familiar tropes exemplified by the term “injun” itself, a shorthand for any number of Eurocentric stereotypes about the continent’s first inhabitants. It is worth noting that the term “injun” is not only erased when it appears as an independent word; the string of letters that comprise it is erased every time it appears—including when it falls within other words with unrelated meanings (such as “injuctive”). This rigorous approach to erasure aligns Abel’s work with the field known as conceptual writing, which ostensibly aspires to link compositional method to textual archive in ways that uncover previously obscure ideological structures. The conceptual purity or rigor involved in deleting every instance of the string of characters “injun” speaks to the relentlessness of settler colonialism, which has a conceptual purity—and a “find and replace” function—of its own. That is, while erasure and cut-up are not always conceptual techniques, in Abel’s work they are used in ways that demonstrate settler colonialism’s cutting up and erasure of Indigenous societies—in other words, they are leveraged conceptually. These cuts and erasures are made most evident in the poems toward the end of the first section of the book. While the short lyric poems in “Injun” are composed as cut-ups that remix fragments of the master document, further cuts—more visually apparent as disruptive blank spaces within the poems—are slowly introduced. First, Abel creates visual caesuras between the words of some lines, a familiar poetic pause that slows the reader’s eye. However, as the poems continue, these apertures infiltrate the words themselves, breaking into “bl ue” and “s ky” in poem “m,” which footnotes the term “prospect” in a way that reveals the incursive and destructive nature of the settler gaze. Over time, these breakages become more and more severe, until words themselves begin to break apart, shattering into phonemes and eventually individual letters that refuse to cohere. Half-way through the poem “r,” the book must be turned upside-down, perhaps a reference to the way settler invasions turned Indigenous peoples’ worlds upside-down, and perhaps as well to the way the colonizer’s language enforces an inversion of world-view. These breakages coincide with a poem that footnotes the term “bloody,” suggesting this violence is not merely lexical, but physical, with the letters spilling across the page linked to a corpus at once verbal and embodied. Once the text turns, the remainder of the poems must be read in this way, with the front cover in one’s right hand and the page numbers hovering, inverted, at the top of each page. There is no returning to a pre-colonial state, but the poems regain a measure of coherence, with words appearing between the fragments. However, they continue to hinge on the violence of western settlement, tracking the terms “scalped,” “redskin,” “country,” “west,” “halfbreed,” “faith,” “title,” and “possession.” The destructive and dehumanizing force of settlers’ faith in our own entitlement to possess this country is apparent in what we see on the page and in how we hold the book, closely linking the poem’s form to its content. Although these cuts, erasures, and reversals might seem to convey total destruction, Injun refuses to represent settler colonialism as successful. The transformations Abel enacts upon his source texts mirror the violence settlers enact upon Indigenous societies, but his book’s insistent contemporaneity and vitality—indeed, its beauty and lyricism—demonstrate the myriad ways in which Indigenous peoples persist and endure. Like the figure on the cover of the book who wears the demeaning mask, using it to deliver a message to her viewers, Injun shows that even the most confining and contemptible images can be deployed in unpredictable, confrontational ways. It is unsurprising, then, that Injun has received the honors that it has: this book reckons with history in order to describe the present, and it does so in a way that is absolutely new. 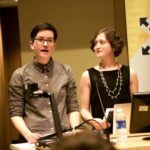 This review accompanies Amaranth Borsuk and Sarah Dowling’s interview with Jordan Abel. You can read the interview here.